For the sharpest image near the borders, keep the object within half the specified depth of field. The length is measured from the lens's front to its flange. 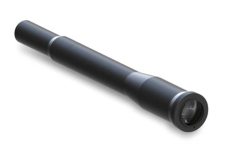 Designed for 35 mm (36 mm x 24 mm) and large format linescan (up to 43.3 mm) camera sensors. Distortion and telecentricity is typically < 0.03%, and is guaranteed not to exceed 0.05%.